That was quick. Just a day after Google pushed out the February patch to Nexuses and Pixels, Essential has also started rolling out the security update to its PH-1 smartphone. It weighs in at around 65MB and arrives as version NMK24B. 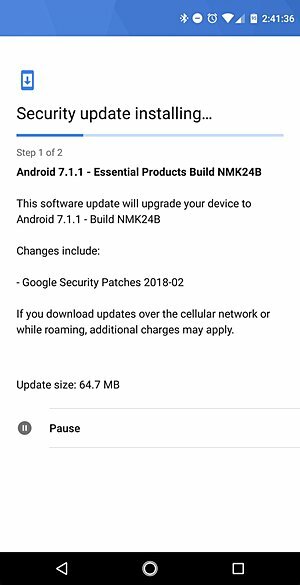 We're rolling out a software update (NMK24B) that includes February 2018 Security Patches from Google. No other major change seems to be included. It's worth mentioning that Essential Phone users on Sprint's network - who were reportedly stuck at the November patch level - have also started receiving this update. I was too happy to install the update, as I was just about to sideload Oreo beta 3.... But then Oreo failed as the package installed is "newer" than that of Oreo :'( Seems I have to wait for Beta 4 or OTA.